Yesterday, I had the great privilige to preach at the midweek chapel service at Alliance Theological Seminary in Nyack, New York. I've only been on campus a few times this semester, which has been mostly for signing a few forms related to financial aid, but I haven't been on campus for classes and I really do miss seeing many of my friends. Many of whom will be graduating very soon in May and I am going to miss them terribly too. When I first learned that I was recommended to preach by one of my professors, I was greatly surprised and then when it was confirmed by seeing my name on the preaching schedule that was distributed to all of the students, I was humbled even more. As I prepared for this sermon, I struggled with what text I would preach from. Would it be something from one of the Epistles? A parable of Jesus? One of the Old Testament prophets, or would it be something from one of the first five books of the Old Testament, the Torah? 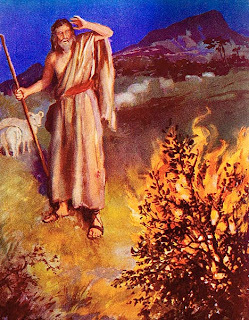 One passage continued to stay with me as I looked through the pages of the Bible and it was Exodus 3:1-15, where God spoke to Moses through a burning bush. I had been reading the passage in Hebrew too, when I began to realize that this was what God wanted me to preach. So, as I traveled home from my Expository Preaching class in New York City last week, this passage began to really be impressed within me and I prayed and said to God that if this was what He wanted me to preach, then I needed His help to understand it more and to preach this passage as an encouragement for my peers and He graciously did so. The student response at the close of the sermon was incredible and many said they were blessed that it was just what they needed to hear, for them at that moment of their lives. A few professors that attended the chapel service said they were blessed by the sermon as well. It is my hope and prayer that as you watch the intro video and listen to this sermon, you may be encouraged to trust God as He leads you, in the fulfillment of His will, to the Glory & Praise of His Name. Trust In The Lord Christian Music Video - Sharefaith from Sharefaith on Vimeo. At the end of the sermon, Kelvin Walker, who is the student pastor for the undergraduate campus at Nyack College, played the chorus to the song, Still I Will Trust You, which a Youtube version of the song is below. Pray all is well with you and wife. Pray all is going well in church you are serving. Just wanted to reach out and praise God for the sermonical teaching you gave in chapel yesterday. It was excellent. I thank God for the call on your life and your faithfulness to the call. Like I said in person, your sermon was really quite refreshing. For me personally, that was probably the most that a message in an ATS chapel really connected with me. It was so good to see you again. It was also so good to see you in the pulpit! Good word today, bro. Thanks for your obedience and faithfulness. You are a blessing! One suggestion other than maybe less points...or perhaps two.. I also think you are generally a funny guy and seeing that side of you as you preach could be nice too.